When most people hear the word “rabies” the iconic image that comes to mind is Old Yeller foaming at the mouth. Many people know that skunks, raccoons, bats, and other wildlife carry rabies, and that rabies occurs all over the United Sates, but many people don’t realize that large animals such as horses and cattle can also contract rabies. Rabies can occur in any mammal. Rabies is a 100% fatal disease caused by a virus that is spread through the saliva of an infected animal, often through bite wounds. Clinical signs can begin within two weeks but can take up to a full year before the disease begins to show. On average, symptoms will begin to manifest 4-8 weeks after exposure. The animal is not infectious until clinical signs begin to show, even if it takes months. There is no treatment for rabies once it’s been contracted. In horses, rabies doesn’t manifest as a foaming mouth. In fact, most horses with a rabies infection simply look “sick.” They are often not eating, seem depressed, and will usually have a mild fever. At his point, rabies cases will quickly progress into the severe neurological signs of stumbling, generally being uncoordinated, possible convulsions, and even colicky looking signs and/or drooling. Other more subtle indications can include changes in behaviors and habits, or an irritable attitude. Once signs begin, the disease will progress rapidly and the horse will usually die within 2-4 days. These signs are very non-specific, so rabies should be on people’s mind any time they notice a horse that suddenly looks uncoordinated. Because the signs of a rabies infection can be easily overlooked or misdiagnosed in horses, before a correct diagnosis is reached an infected horse can expose multiple people and animals to the infection through their saliva, which contains the rabies virus. Family members, people caring for the horse, other animals that come in contact with the horse, veterinarians, and even strangers who stop by a fence to pet or feed the horse can all be exposed to this fatal disease, necessitating costly post-exposure treatment. In Colorado, rabies was rare until 2008, when skunks started to appear with the disease. In 2009, there were 103 rabies cases, including one horse. As of September 2013, 3 horses in Colorado have been diagnosed with the disease. The management of wildlife helps with prevention, but the best, most effective, and only certain way to ensure your animals don’t contract rabies is through vaccination. Here at MVS, we recommend rabies vaccines for all of our equine patients, with a single annual booster. 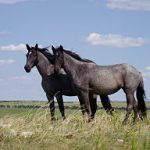 The cost of the rabies booster is very small, and the rabies vaccine is quite safe and very effective at protecting horses from contracting rabies. For a disease like rabies, which is 100% fatal and has no treatment, and where there are very serious public health ramifications to you and your family in addition to the loss of your horse, the rabies vaccine is a critical one. A properly vaccinated horse is the only horse that will survive infection with rabies. As a side note, we know that many horse owners vaccinate their own horses. We have spoken with the state veterinarian, and they confirm that just like with dogs and cats, a horse must be vaccinated by a licensed veterinarian to be considered protected from the disease. Therefore, in the event of a suspected rabies exposure, if your horse was not vaccinated by a veterinarian, they will be considered unvaccinated by the State of Colorado! Give us a call today to schedule an appointment to protect your horse, and your family, against this fatal disease.